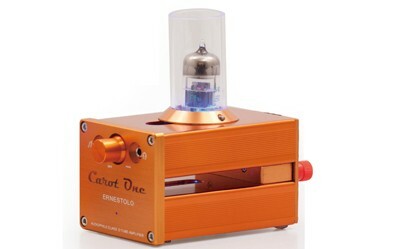 Introducing the Carot One Ernestolo Class-T Integrated Amplifier - a sound enhancing compact system with an anodised aluminium orange finish and blue glowing top mounted tube. Once powered this desktop amplifier will produce warmth and resonance while delivering exceptional clarity. Set this unit up with your computer, iPod, stereo system or other audio application in a near-field listening environment and grant your audiophile attention and obsession to the Carot One Ernestolo. The mini-size Class-T stereo amplifier Ernestolo provides up to 2x 15W of output with a bundled AC power supply unit. Thanks to Tripath’s proprietary Class-T digital power processing technology combined with special techniques in circuit design and component selection, Ernestolo achieves the sound quality of high-end Hi Fi at an affordable price.